Previous Webinar Simplified Technical English – Let Us Show You How! Q4 Magazine (Winter Issue) – from a complaint from Dr Grumpy through to AI in Tech Pubs – what are we seeing at Tech Data World? We are delighted that this week we published the online issue of the TDW Magazine. Our final issue from the 2018 series of magazine. You can read the magazine online now for FREE. What’s inside the Q4 Magazine (winter) issue? STE do you need software? The Big Question – is your supplier holding you back? Make sure you create your free account on TDW, follow us on all our social media channel and for those who want more – join us as a full member! During 2019 we are further ramping up our content to our network – make sure you are on our mailing list to get notified when we make the content available. We are always looking at education, real-life and experiences when supporting technical publications and support information in our market. If you would like to contribute an article or indeed a series of articles please get in touch with us at Tech Data World and we will discuss how you may get involved. 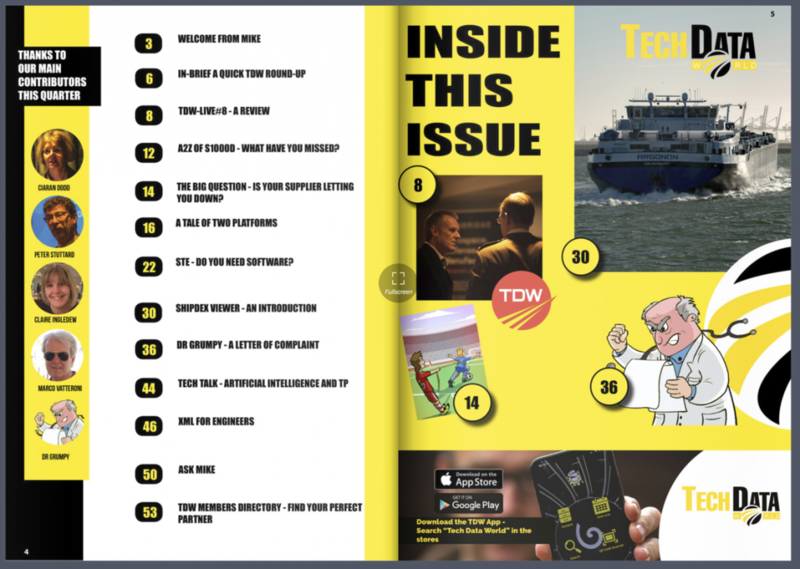 Download the TDW App – it’s the best way to keep up with what we are doing – search Tech Data World in the app store of your choice!